Over the past few weeks we have been focusing on how to preserve, can and freeze all of our garden tomatoes. 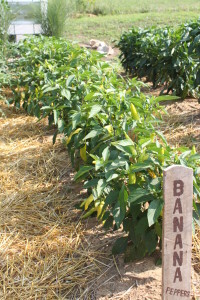 Now that our tomato crop is finally winding down to a manageable level, it is time to switch our focus to preserving our hot peppers. We love to eat banana and jalapeno rings on our sandwiches, pizzas, nachos and in various other dishes. We have always preserved our peppers this way, however we did change one minor detail this year. In the past we used pint jars – which seemed like a terrific idea because of the amount of produce you can pack into one jar. However, after we would open a jar, we would use only 1/4-1/2 of the contents, with the rest going to waste. So this year, we decided the smart thing to do is to can all of our hot pepper rings in half-pint jars, hoping to stay within our theme of reducing waste in our home. You can use this recipe with almost any pepper that you have. Don’t limit yourself to banana peppers. 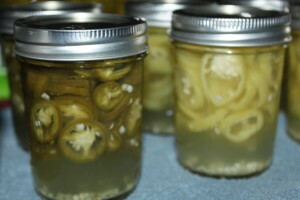 You can use this same pickling brine liquid to preserve jalapenos, habenaros, cajun belles, cayenne peppers, and more. Just make sure you label each jar so you know what you are putting on that pizza! *Prepare canning jars (sterilize and keep warm) and prepare hot water bath. 1. Most important step –If you are working with hot peppers be sure to wear gloves before slicing them. Believe me, a pound of hot peppers doesn’t seem like a lot, but your fingers will burn and ache for hours if you don’t wear gloves. 2. 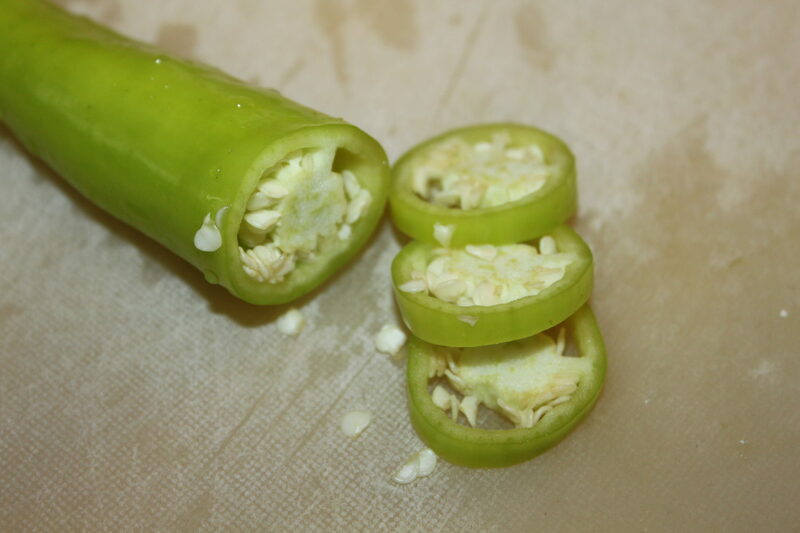 Wash and stem peppers. Slice into 1/8-1/4 inch slices. Set aside. 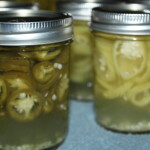 Pack rings in the jars and then add the hot liquid. 3. Place vinegar, water,and pickling salt in a medium sauce pan and place on medium heat. 4. Peel and smash the garlic cloves and place them in the vinegar/water mixture. 6. Remove skins of garlic and cut each clove in half. 7. Fill each hot jars with 1/2 of a clove a garlic and then add the pepper slices, making sure to leave 1/4″ of headspace at the top of the jar. 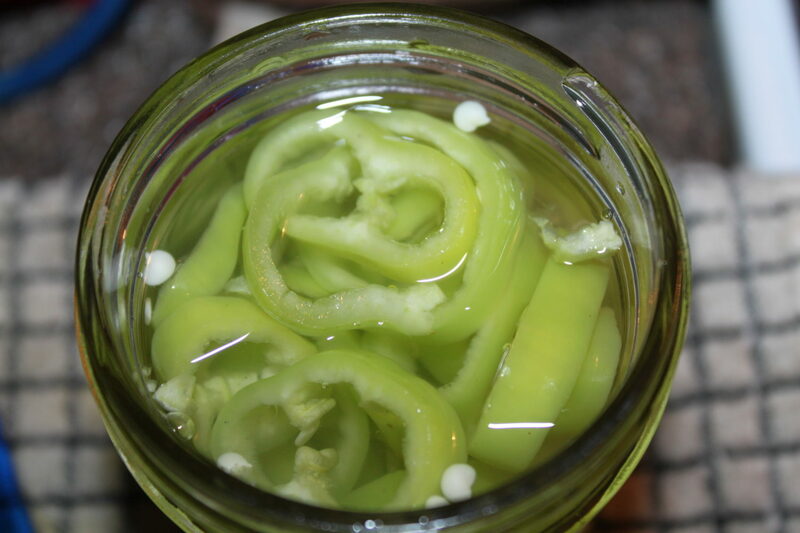 The peppers float to the top of the jar when heated, but return to the bottom once cooled. 8. Ladle the hot liquid into the jars filling to cover the peppers, maintaining the 1/4″ of headspace. Use a plastic utensil to remove any air bubbles – you may need to add additional liquid. 9. Add warm lid and ring. Process in hot water bath for 10 minutes for half pints or pint jars. * Adjust for altitude as necessary. 10. Remove and let cool for 24 hours. Check to make sure the jar is sealed prior to storing. If jars did not seal (the lid bounces up and down), place in refrigerator and use within 2 weeks. Prepare canning jars (sterilize and keep warm) and prepare hot water bath. Most important step –If you are working with hot peppers be sure to wear gloves before slicing them. Believe me, a pound of hot peppers doesn’t seem like a lot, but your fingers will burn and ache for hours if you don’t wear gloves. Wash and stem peppers. Slice into 1/8-1/4 inch slices. Set aside. Place vinegar, water,and pickling salt in a medium sauce pan and place on medium heat. Peel and smash the garlic cloves and place them in the vinegar/water mixture. Remove skins of garlic and cut each clove in half. Fill each hot jars with 1/2 of a clove a garlic and then add the pepper slices, making sure to leave 1/4″ of headspace at the top of the jar. Ladle the hot liquid into the jars filling to cover the peppers, maintaining the 1/4″ of headspace. Use a plastic utensil to remove any air bubbles – you may need to add additional liquid. Add warm lid and ring. Process in hot water bath for 10 minutes for half pints or pint jars. * Adjust for altitude as necessary. Remove and let cool for 24 hours. Check to make sure the jar is sealed prior to storing. If jars did not seal (the lid bounces up and down), place in refrigerator and use within 2 weeks.